You are here: Home » News stories of interest » Does Bodog still accept US players? No. It’s official, Bodog does not accept players from the U.S.A. any longer. From the beginning of 2012, existing Bodog players from America will be moved to a new U.S. friendly poker room called Bovada. Bovada is a new poker room owned by the people behind Bodog. It is unusual in that while it accepts players from the U.S.A., it does not accept players from any other country. So it is a uniquely American poker room. The software – in fact, everything – is the same as the Bodog site. Even the deposit limits and methods are the same as they are on Bodog. This move is to protect their U.S. players against any government actions in the future. As part of that effort to protect their site, the new Bovada site is registered in Latvia. That means that their full site address is bovada.lv – the .lv stands for Latvia. Why Latvia? Well, any address that doesn’t have dot com in it should be safe from the clutching grasp of the US government, but I suspect that the .LV domain name was chosen because LV also stands for Las Vegas. And for sure when most Americans see the .LV extension they won’t think of Latvia, they will most likely think of Las Vegas. As an aside, not many people realize that, while the dot com extension is universal and does not represent any individual company, it is in fact under the control of the American Government. 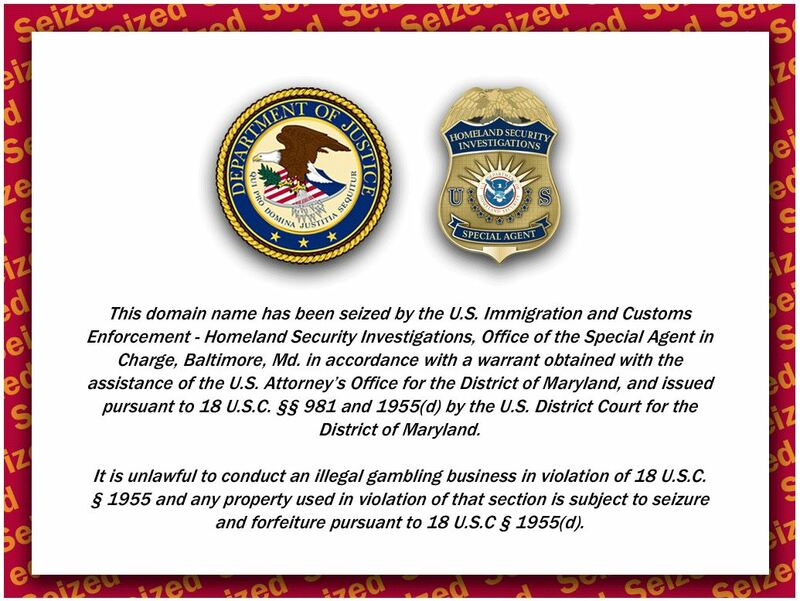 And that is why, should you surf to the old Bodog domain at Bodog.com you will see the, by now all too familiar, scary looking Seizure notice from the DOJ. 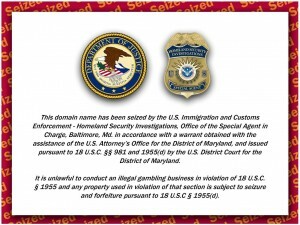 The ability of the US authorities to seize any dot com domain came as a bit of a shock to the internet community, and especially so to online gambling sites. The country specific TLD (top level domain) for the United States is dot US, though you don’t see too many of those around. The fact that dot coms are subject to seizure by this government has led to many, many legal online gambling sites to change their addresses to non dot com ones. Even gambling operators who never did any business in America have changed away from that universal extension. So all of that makes sense now, hopefully. The only curious aspect of this change is that the new poker site at Bovada not only accepts Americans, as expected, but only accepts Americans. As explained above, we can see why this poker operator would rebrand to protect itself against any outside actions by an unfriendly government, but as to why they would restrict the new site to only Americans is a bit confusing. Surely this will limit the player pool available to the new poker room. On that note, we cannot determine just how many players are actually playing at Bovada these days. As I am not from the US, I can not play there. And Bovada, just like Bodog, does not allow data mining, so that none of the online sites that monitor poker site player numbers can find out how many players are on there either. Remember, the dot com version of the Bodog brand is no longer functioning but the dot eu for Europe and the dot ca for Canada are still operating. I would have thought it would make sense to pool those players into one base and share that base with all their sites, including Bovada, so that each site would have a bigger player pool. But that is not what they have done. I suppose they know the legality of their business better than I do. Anyway, in effect, the new Bovada site is the same as the old Bodog site, but just for Americans. All these twists and turns should hopefully make Bovada safe for Americans to play at. Now free from the risk of seizure, Bodog, or rather Bovada, can do what they have always been good at; running a good poker site and taking care of their customers. While the whole question of online poker for Americans is a tricky one, of the few remaining sites that are welcoming those players, Bovada does appear to be the safest choice right now. The small number of players on the site belies the fact that this brand is a worldwide business, and they have been involved in online gambling for a long time. They do know what they are doing, and it seems that they intend to stay in business no matter what comes at thme. As with all sites that cater to US gamblers, getting your money into and out of this site can be a little bit tricky. They do their best, but the number of options for payment processing is limited. Again this is a safety feature, as many of those payment processors are subject to interference by government agencies, so those options that are supported by Bovada Poker are the most reliable and secure options available. You may lose your money at the poker tables, there is not much they can do about that. But every other possible precaution has been taken by this site so that you should not run the risk of losing your funds because of any other event.